NEWPORT NEWS, Va., Feb. 3, 2015 (GLOBE NEWSWIRE) -- Huntington Ingalls Industries (NYSE:HII) reached another milestone in the life of the company's newest Virginia-class submarine, John Warner (SSN 785), on Monday as the crew began moving aboard and ate its first meal prepared in the ship's galley. The submarine, named after former Senator John Warner, is in the final stages of construction and testing at HII's Newport News Shipbuilding division. "The in-service milestone is an important event in the life of the submarine John Warner," said Cmdr. Dan Caldwell, the submarine's prospective commanding officer. "The ability to work and live aboard the ship will give the crew the opportunity to become more familiar with the equipment they will operate and places us one step closer to our ultimate goal of taking this submarine to sea." 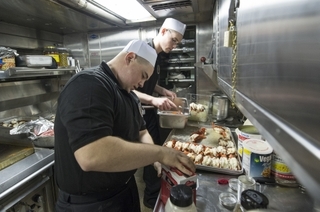 Sailors prepared surf and turf for the 146-member crew that will serve aboard John Warner. They also received a congratulatory note from the ship's namesake and her sponsor, Jeanne Warner, that read: "May today's inaugural luncheon set a precedent to be repeated once a year … as a reminder of, and pay tribute to, all the PCU crews and shipbuilders whose dedicated skills built this magnificent submarine, SSN 785. The proud sponsor, Jeanne, and I are with you in spirit today and pass on the traditional Navy 'well done.'" Construction of John Warner, the first Virginia-class submarine to be named for a person, began in 2010. The boat was christened Sept. 6. John Warner is 96 percent complete and on schedule to be delivered later this year. The submarine's next significant construction milestone is initial sea trials, an aggressive series of operational tests that demonstrate the submarine's capabilities. "This is a special milestone for the shipbuilders and the crew," said Jim Hughes, Newport News Shipbuilding's vice president of submarines and fleet support. "From now on, this ship will take on the personality of her crew as they move aboard. For the shipbuilders, it marks significant progress toward delivery and reminds us that we are not only building a warship, but a home for these sailors as they work to protect our country." The Warners also had 10 cakes delivered to the crew from Rowena's Specialty Cakes and Drizzles in Norfolk. "Because of my longstanding respect for Rowena as an individual and marvelous representative of the Hampton Roads region, I wanted to have her cakes served as part of the first meal ceremony," John Warner said. Huntington Ingalls Industries is America's largest military shipbuilding company and a provider of manufacturing, engineering and management services to the commercial and non-commercial oil, gas and energy markets. For more than a century, HII's Newport News and Ingalls shipbuilding divisions in Virginia and Mississippi have built more ships in more ship classes than any other U.S. naval shipbuilder. Headquartered in Newport News, Va., HII employs approximately 38,000 people operating both domestically and internationally. For more information, please visit www.huntingtoningalls.com.